The DV-GP3-USB is a power extension cable allowing you to power the GoPRO Hero 3/3+ and includes a USB AC Wall Adapter. While a USB cable is suitable for many applications, the DV-GP3 adapter locks into the battery receptacle on the back of the camera, so you no longer need to rely on the USB connection on the side of the camera which can come out easily. Providing a reliable and secure power connection is essential when using the camera, since the GoPro’s are often put in precarious, high impact situations. The adapter also allows the use of the front submersible housing of the GoPro and the skeleton back. Covering the back skeleton housing openings with some gaffer tape, would prove to offer a splash/water resistant housing for many situations. Because this solution is a cable rather than a battery, there is no heat generated by this solution, reducing the chance of overheating of the camera. 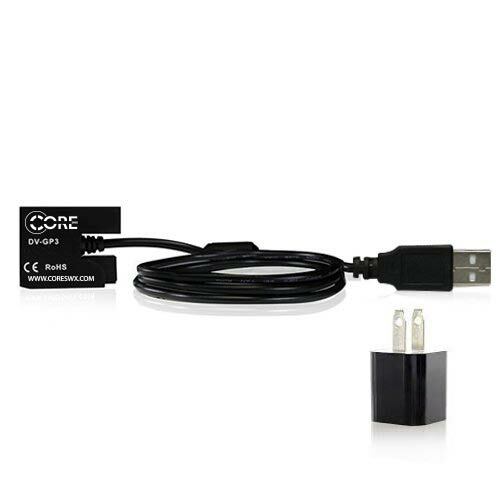 The cable is offered in a 10′ length and is a perfect solution for when you need to run the GoPro camera for extended run times from and AC wall socket.